Blog post by dog behaviourist Laure-Anne Visele, The Hague: on the many factors that lead to ‘misbehaviour’ in dogs. Privacy: Details and photos shared with explicit permission from the owners. Important details where changed so the owners could not be recognized. Why does my dog behave like that? 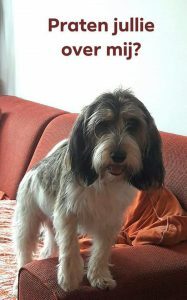 Meet Limo, a Petit Basset Griffon Vendeen. I saw him in consult the other day. Why did they ask for help? 1. Limo goes beserk when he as much as smells another dog outside. Sometimes, he oddly doesn’t seem to see them coming and only reacts (hysterically) when they are right next to him. 2. He has bitten his owners and guests several times when touched whilst on the couch. They think it’s territorial aggression, but he’s perfectly happy letting them approach when he rests there, provided he is facing them and awake. 3. He is friends with the mother-in-law’s dog, who frequently visits, at all times except when his owners approach the guest dog. He then blocks his passage and drives him to the garden. The owners suspected territorial aggression for the couch/chair stuff, and jealousy when it came to the other dog and kids. But I wanted to dig deeper, so we had a detailed conversation. Without digging deeper into what is causing, exacerbating and maintaining the behaviour, I might as well let the dog eat whatever homework I prescribe. It turned out that, as usual, the problems were multi-factorial: many things had contributed. 10. Suspected hearing problems. We are having the vet check this. 11. Fear as the underlying emotional motivation for biting on the couch and other dogs. 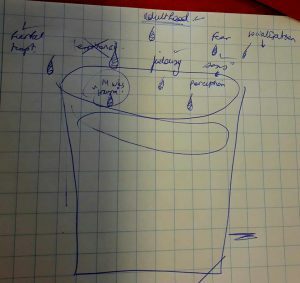 I was able to draft a behaviour plan that drew on Limo’s bucket list. We’ll be doing a BAT derivative, focusing on his problem with dogs at first, and gradually expanding to his other triggers, including kids. 3. Reward and honour his stress signals. As for his mother-in-law’s dog, not all dogs can be expected to welcome other dogs with open paws, and I advised they seek an alternative solution next time mother-in-law comes to town. As usual, let’s see what a few weeks of this will do, and then re-group. Benal, 2014: Why ask why? 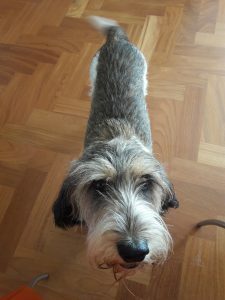 This entry was posted in Dog behaviour and tagged behaviour therapy the hague, causes of dog behaviour, dog training the hague, gedragstherapie den haag, hondentraining den haag, petit basset griffon vendeen, possessive aggression, why dogs misbehave. Bookmark the permalink. Post a comment or leave a trackback: Trackback URL. You are here: Home » Canis blogus » Limo’s bucket list: Why is my dog behaving that way?